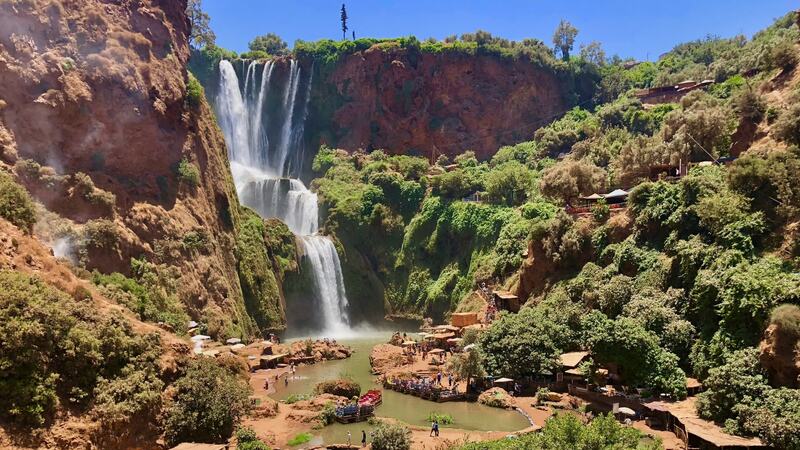 One of the most spectacular sights in Morocco are the Cascades of Ouzzoud. Marvel at the majestic succession of cascades and the permanent rainbow created by the mist thrown up by the water, with free time and the opportunity to take some superb photography that you will always treasure. Departure at 8,00 AM for demnate and olive groves. We pass by the natural stone bridge of Imi Nifri and wander along the lush green scenery of lively valleys. We will also visit a traditional old mill and have lunch nearby the waterfalls. This is a good place to enjoy a Berber tajine of middle atlas. Imi N’ifri (natural bridge) arriving in Demnat, continue 5 km along the narrow road along the Mehasseur river valley until you reach Imi N’ifri, “doors of the Abyss” in Berber. This remarkable site is the result of water erosion against rock. At the top of this monumental natural arch, flanked by gigantic stalactites and stalagmites, swarms of crows and pigeons circle. The juxtaposition of these verdant and luxurious falls in a land of red sandstone, dust and dessert somehow brightens your outlook and puts a spring in your step. The sheer joy of nature and the life giving force of water seems to be captured in every shiny leaf and exploding flower bud that clings and populates the luscious river gorge.